Kawhi Leonard played in San Antonio last night for the first time since being traded from the Spurs to the Raptors, and he was booed heartily every time he touched the ball. The home crowd even whipped up enough bile to hit him with a “Traitor!” chant while he was shooting free throws. Leonard, somehow, seems to think this was all the media’s fault. 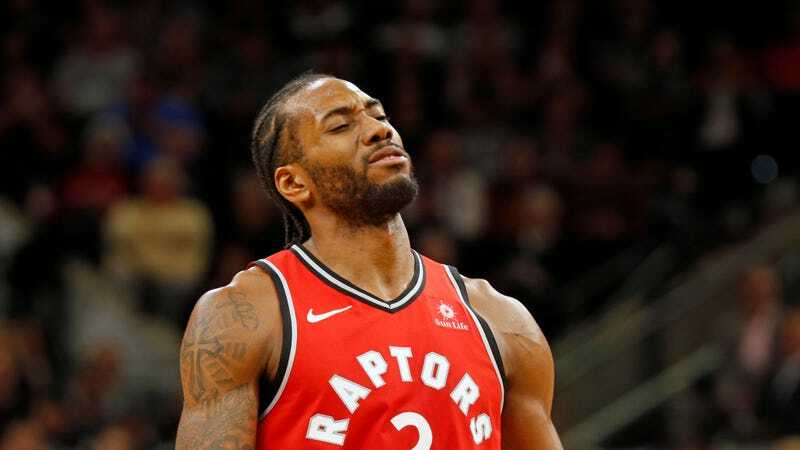 However you feel about an angry home crowd going nuts on a returning former star, it’s damn near impossible to argue that the anger in the arena last night was created by anything other than Leonard’s own actions. Leonard simply disappeared from the Spurs organization for an entire season, refused to ever comment publicly on what the hell was going on with him, turned his own teammates against him, and then forced a trade. Which part of that is the media’s fault, exactly? There’s nothing wrong with a star player using every bit of leverage he has in order to set his career on whatever path he desires, and there’s also nothing wrong with an NBA fanbase harboring some ill will towards a guy who bailed on them without ever explaining why. Leonard trying to insert the media into this equation as a mitigating factor is just as corny as it is wrong, and will probably just make his former fans hate him even more than they already did.